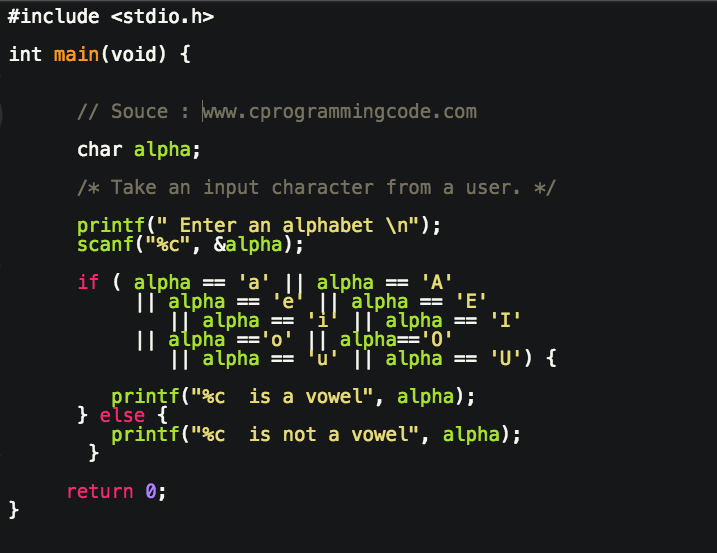 Write a c program to check whether a character is vowel or consonant. In this program, we take an input character from a user and our code will check whether an input character is vowel or consonant. Before start writing code, let's first understand what is vowel and consonant? What is vowel and consonant? In english, Alphabet a, e, i, o, u is called vowel and rest of the alphabets is called consonant. 1. Take an input character from a user. 2. Compare input character with a, e, i, o, u, A, E, I, O, U. If it matches with any of them then it's a vowel otherwise it's a consonant. In this example, we take an input alphabet from a user and then compare with a, e, i, o, u (upper and lower case both). If input character is matches then it's a vowel otherwise it's a consonant. 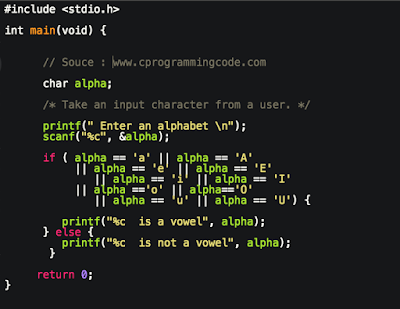 In this example, we use switch statement to check whether an input alphabet is vowel or consonant. The logic is same. In this case, we solve this problem in another way using switch statement. // Take an input character from a user. have tried the same program on visual studio ultimate 2012 but have found two errors. 1. on the opening brace after the "if (condition)" it says Error: expected an expression.